Jay Reakirt of Albany, Georgia, has written a very good book on blacksmithing. And it's about time: he has been a professional smith for over 30 years. After trying other trades, by 1970 Jay was thoroughly committed to working iron, and he has been hammering ever since. 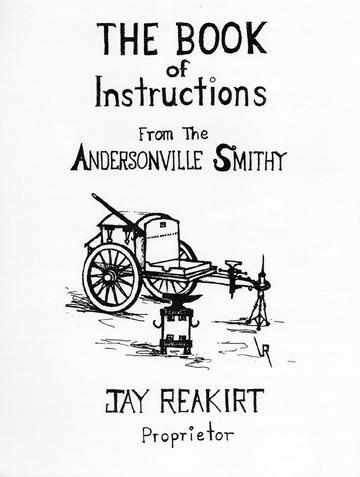 The Book of Instructions From the Anderson Smithy starts with a brief history of iron, then continues right into how to build your forge, information on tooling, how to build and tend the fire, how to use basic tools, and how to do the basic forging operations including the forge weld. Jay even shows you, the reader, with careful illustrations, how to make your own tools. I especially liked his section on making tongs. And Jay is ingenious when it comes to making tools and "jigs" that work extremely well. The author also goes to great lengths with his illustrations as well as instructions to explain how to make your own supply of tools. His drawings and illustrations are copious, clear and easy to follow. They show how to make dozens of wonderful projects including knives, wheels, hinges, hooks, chain, rivets, nails, tripods, fire dogs, candlesticks, latches, barbecue tools, bells, fireplace tools, and lots more. Other subjects covered in the book are: The Bessemer Process, Art and Craft Shows, Rebuilding and Repairing Old Anvils, Top Repair, the Make-Do Starter Anvil, Knifemaking and Wheelwrighting. The author also included step-by-step instructions with drawings on making a portable forge, portable vise, and portable anvil stand, enabling blacksmiths to bring their shop along with them anywhere.